We were waiting for Obama’s last minute parting gifts as he heads out the door and here they come. The NY Times reports that Barack Obama has issued a rule that bars states from denying federal money to Planned Parenthood. What else would one expect from this failed president but a plethora of gifts, rules and regulations that will have to be undone by president-elect Donald Trump. 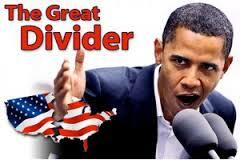 Note to Barack Obama, to borrow his own words, “elections have consequences” … and you lost. This is what a community agitator does. They can’t get anything accomplished when they are in office, so on the way out they door they pass last minute BS that makes it difficult on the incoming administration. I take it back, Barack Obama is the worst president this country has ever seen. Good riddance. Mindful of the clock ticking down to a Trump presidency, the Obama administration issued a final rule on Wednesday to bar states from withholding federal family-planning funds from Planned Parenthood affiliates and other health clinics that provide abortions. The measure takes effect two days before the Jan. 20 inauguration of Donald J. Trump. The rule was proposed three months ago, when many Democrats assumed the next president would be Hillary Clinton; she presumably would have promoted the rule’s completion if it were still pending. It requires that state and local governments distribute federal funds for services related to contraception, sexually transmitted infections, fertility, pregnancy care, and breast and cervical cancer screening to qualified health providers, regardless of whether they also perform abortions. Mr. Trump has sent mixed messages on Planned Parenthood’s work, supporting its health-related services other than abortion. Yet with backing from Republican leaders in Congress, he has indicated he will undo many Obama administration rules and regulations, especially last-minute additions. In this case, however, unraveling the new rule would first require a time-consuming process, according to the Department of Health and Human Services. HHS & HealthCare.gov Official Marilyn Tavenner: “Please Delete this Email” … More from the Most Transparent WH Administration EVER! YUP, NOT A SMIDGEN OF CORRUPTION … And now for something completely different, the Obama administration deleting emails. From Sharyl Attkisson comes the latest example of not a smidgen of corruption from the Obama administration. 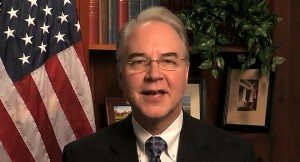 Attkinsson reports that an email obtained by Congress shows the top official for Healthcare.gov at CMS under the Department of HHS, Marilyn Tavenner, instructed the agency’s top spokesman to “Please delete this email.” It would appear other than golf, the Obama administrations greatest past time is deleting emails and keeping the truth from the American people. Transparency, eh? In a letter today, House Energy and Commerce leaders asked Tavenner to explain why she asked her colleague to delete the email, and the letter questions whether there are other instances in which she instructed HHS staff to delete emails. The letter also asks for more details regarding Congressional subpoenaed documents, including Tavenner emails, that CMS recently said might be permanently lost; and it requests an explanation as to why redactions are made in some documents provided to Congress so far. HHS Secretary Kathleen Sebelius managed to put as much preparation and management into her resignation speech as she did her handling of Obamacare. 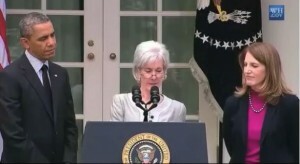 As Sebelius was reading her heart-felt prepared, written speech a funny thing happened, a page was missing. Good grief. How could any one be such a screw up and so unprepared? 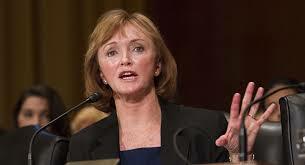 Maybe, her speech writers just didn’t have it in them to spew more lies that Obamacare is good for America. It was a fitting send off for Sebelius, to have one more glitch for the road. It was priceless as Sebelius was flanked by Barack Obama and her supposed to be replacement, if Senate approved, OMB Director Sylvia Burwell. Outgoing Health and Human Services Secretary Kathleen Sebelius officially announced her resignation Friday, but just like the glitches that plagued the federal website for Obamacare – healthcare.gov – which she was responsible for, Sebelius experienced a glitch of her own when the last page of her speech went missing. Photo of the day … One more glitch from Kathleen Sebelius as Obama looks on and can be seen to nudge her to go on and don’t make me look like more of an idiot.